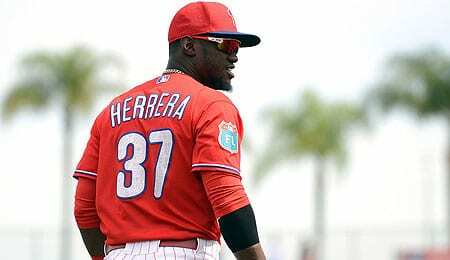 After going 71-91 in 2016, the Philadelphia Phillies will continue their rebuilding program in 2017, even if seems to be going very slowly. The Phils made the playoffs every season from 2007 to 2011, winning the title in 2008, but have now been under .500 in each of the last four seasons, including 90+ losses the last two years. The offense in 2016 was anemic. The team finished 29th in the majors in hitting (.240), last in runs scored (610), 28th in hits (1,305), 24th in home runs (161), last in RBI (574), 29th in walks (424), 29th in OBP (.301), 29th in SLG (.384), last in OPS (.685) and seventh in strikeouts (1,376). So, it’s safe to say the offense can only go upwards. Second baseman Cesar Hernandez led the team in hitting, but was criticized for not producing in clutch situations. However, he should be at the top of the lineup or batting second, so he can get on base and swipe some bags. Tommy Joseph wrestled first base away from longtime keeper Ryan Howard, and hit 21 home runs in 107 games. Meanwhile, third baseman Maikel Franco hit 25 home runs and knocked in 88. These two will be in the middle of the lineup, and will need to continue the progress they made in 2016 if this team is going to improve. Heading into Spring Training, the battle for rotation spots for 2017, it’s safe to say, will very easily be among the most competitive in the game. Jeremy Hellickson, Aaron Nola (assuming he’s healthy) and Clay Buchholz (who came from the Boston Red Sox in a trade a couple of weeks ago) will be the first three starters, but after that the final two starting spots are up for grabs. Among the candidates are Zach Eflin, Jerad Eickhoff (he probably has the inside track on one of the slots), Ben Lively, Jake Thompson and Vince Velasquez (best bet for the other slot). That’s a lot of young talent, but Fantasy owners need to see who is ready to be a starter in 2017 and who needs to go to the bullpen or head back to the minors. As for the organizational pitching prospects, Lively won 18 games over two different levels in 2016. Mark Appel, a former first overall pick, is coming off a season-ending elbow injury, and needs to show the organization that he is ready to step in, or perhaps the team will move on from him. Some other pitching prospects to watch who may be able to help out in the next year or two include Ricardo Pinto, Nick Pivetta and Elniery Garcia. Meanwhile, on the offensive side the prospects are much closer to making the majors. Shortstop J.P. Crawford, the team’s top prospect, could be up with the Phillies by mid-season, while outfielder Nick Williams, catcher Jorge Alfaro, first baseman Rhys Hoskins (who hit 38 home runs last year) and outfielders Roman Quinn and Dylan Cozens (who hit 40 home runs last year) are not that far behind, and all could be in the big leagues by 2018. This offseason, the Phillies not only acquired Buchholz, but they also added second baseman/outfielder Howie Kendrick from the Dodgers, while increasing their bullpen depth by picking up relievers Pat Neshek from the Astros and Joaquin Benoit from the Blue Jays. All four of these players, depending on how the season goes, may be used as trade bait in deadline deals to help bring in more young talent. The Phils have more reason to be optimistic, especially given the talent in the minors, but in 2017, they need to get better when it comes to offense, especially with runners on base, and they need to stay healthy, especially the starting rotation, who lost Eflin and Velasquez to season ending injuries in 2016. Philadelphia starts its season on April 3 against the Cincinnati Reds, so you won’t have to wait too long to see how this team stacks up against the rest of the National League. Now it’s your turn. Let us know in the comments below how you think the Phillies will do this year and some of the team storylines you’ll be following. This entry was posted on Wednesday, January 11th, 2017 at 9:54 pm	and is filed under BASEBALL, David Weightman, Team report. You can follow any responses to this entry through the RSS 2.0 feed. Both comments and pings are currently closed.